Next month is going to be a good one for pigeon lovers everywhere. 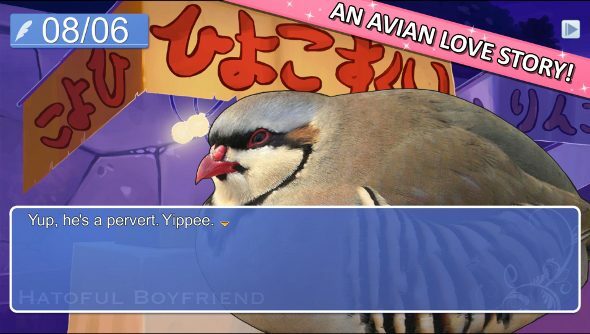 On August 21st pigeon dating sim Hatoful Boyfriend will finally launch, according to publisher Devolver Digital. The sim, as if you didn’t already know, puts players in the role of the only human in St. PigeoNation’s Institute, a prominent school for birds. Your goal? Find love, of course. Finding love, even among pigeons, is tough though. So you’ll need to hit the gym and study to attract the perfect mate with the best plumage. The game’s a remake of Hato Moa’s visual novel, and includes a new scenario and ending, so there’s even more opportunity for love in the sky. A Collector’s Edition includes the original visual novel, a digital soundtrack, a new comic from the original developer and a few other bits and pieces. There’s a 10 percent discount on Steam right now, so you can pre-purchase the regular edition for £6.29/$8.99 or the Collector’s Edition for £10.79/$13.49.